Engage Cymru is the leading membership organisation for gallery education in Wales and has over 70 members, including galley and museum educators, teachers, local authority officers and artists. Engage Cymru promotes gallery education through advocacy, regular area group meetings, networking and professional development training events, and through its research projects. Click here to learn more about Engage Cymru. Engage Cymru on behalf of the Wales Arts Health & Well-being Network has been asked to share arts and health projects which are tackling loneliness and isolation in time for the next Welsh NHS Confederation briefing paper deadline in early March. Engage Cymru is delighted to announce it has been successful in its application to Arts Council of Wales to support a programme of work aimed at young people at risk of offending, offering opportunities to achieve an Arts Award, in partnership with Theatr Clwyd in 2019. This work will build on and consolidate earlier Engage Cymru programmes with young people at Parc Prison Youth Offending Institute and Hillside Secure Unit and respond to recommendations in the Youth Justice Board’s ‘Charlie Taylor’ Review which advocates for meaningful activity as one way of preventing offending behaviour. To include the launch of Live Music Now’s ‘Live Music Now’ report. Further information and booking details to follow. During Age Positive Week 12 people living with dementia and their carers took part in a lively Dementia Friendly Galleries taster workshop at Oriel Myrddin supported by Arts Council of Wales, Western Power Distribution, Arts & Business Cymru, Glynn Vivian Art Gallery, Oriel Myrddin and Age Cymru. Artists Lucy Donald, Nathan Down and Louise Bird engaged participants in exploring the gallery’s ‘Haptic Tactic – in Search of the Vernacular’ exhibition and made artwork in response. This work forms part of the wider Engage Cymru Dementia Friendly Galleries programme which is supporting galleries to gain Dementia Friendly Venue status. The programme has included Dementia Awareness sessions for artists and arts organisations led by the Alzheimer’s Society and Dementia Friendly Galleries training led by Engage Cymru with support from Bangor University Dementia & Imagination researchers and artists. Engage Area Group Representatives and Special Interest Representatives come together to form the Engage Council of Members, which meets regularly to offer feedback on projects and programmes, helping Engage to shape activity to benefit colleagues working in the sector. Joining the Engage Council is a fantastic opportunity to connect in meaningful and constructive ways with colleagues not only in your local area, but across the country. As an Area Representative you'll have support from Engage to programme regular meetings, with speakers and topics you feel are relevant to your region and professional network. As a member of Council, you'll join a group of engaged, dynamic colleagues from across the country, who form a much valued advisory body for Engage. We are currently recruiting for North West Wales. Please note Council Members must be members of Engage. Additionally if you work for an organisation you will need to have the support of your manager to take up this role. We welcome applications from people from a broad range of backgrounds. Great news for Engage Cymru! Engage Cymru is delighted to announce its successful joint bid to A&B Cymru CultureStep with business sponsor Western Power Distribution, to support its Dementia Friendly Galleries training programme. This is the first time Engage Cymru has secured business sponsorship and we are looking forward to working closely with Western Power Distribution to help tackle barriers and challenges which face people living with dementia through the arts. Western Power Distribution are the electricity distribution network operator for Midlands, South West and Wales who deliver electricity to over 7.9 million customers. The partnership will help to promote their Priority Service Register aimed at older and vulnerable people living in the community, ensuring they receive a priority service if they experience a power cut – a particularly worrying time if someone relies on electricity for medical equipment or if they are elderly, ill or disabled. Engage Cymru will share details about the service via project partners and the Wales Arts Health & Wellbeing Network which it coordinates. CultureStep will add value to the project through supporting bespoke hands-on gallery activities during Age Positive Week in October and support the training of artists in order to establish a pool of freelance practitioners able to deliver stimulating and enjoyable activities in South and West Wales. In September 2017 Engage Cymru delivered ‘Unlocking Potential’ – an ACW funded training event in partnership with Denbighshire County Council and Helfa Gelf, along with a toolkit aimed at artists working with young people in secure environments and those at risk. The event brought together over 40 delegates from the arts, education and youth justice sectors in England and Wales to hear about best practice in engaging vulnerable and disengaged young people through the visual arts. Speakers included Dusty Kennedy, Head of Youth Justice Board Wales speaking about the Youth Justice Review (the Charlie Taylor Review), and opportunities this may open up for the arts sector; The National Criminal Justice Arts Alliance, and artists Pip Lewis and Simone Bizzell-Browning ran a practical session on delivering Arts Award. Documentation from the event is now available to view (including video of the speakers, and PDFs of their presentations). You can also download an Evaluation Report from the project - click here. 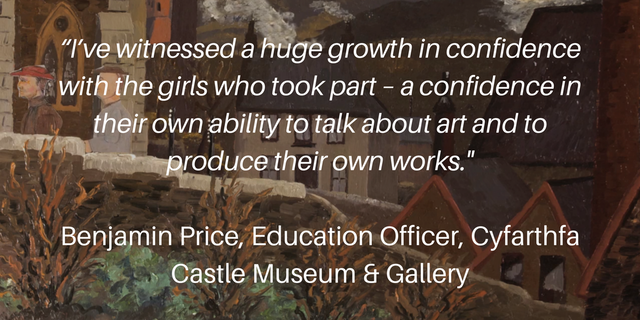 From April 2017 Engage Cymru delivered a 12-week intensive animation project in partnership with Cyfarthfa Castle Museum & Gallery, Pen y Dre High School and artist animator Gerald Conn to mark the Contemporary Art Society for Wales’ 80th anniversary. Pupils brought a number of paintings acquired from CASW to life through animation and created innovative interpretation resources for the gallery which will sit alongside the original paintings. See images from the current animation project here. This project was inspired by the ‘Animating Art History’ programme initiated by the Courtauld Institute. The screening premier will took place at the Red House, Merthyr on 8 July. You can view the films and artwork made during this project alongside an exhibition at Cyfarthfa Castle Museum & Gallery throughout October. In August 2016, Engage Cymru worked in partnership with Unitas supporting 14 children and young people from Parc Prison Youth Offending Institute and Hillside Secure Unit to achieve Bronze Level Arts Award. These pilot interventions were generously funded by the Foyle Foundation. Wales based artists Tom Goddard, Anna Barratt, Pip Lewis and Simone Bizzell-Browning devised innovative, intensive visual arts interventions using the young peoples’ interests as the starting point encouraging them to engage in a wide range of creative activities aimed at raising motivation levels, increasing self-esteem, developing research, numeracy, digital and literacy skills. Find out more and download the final evaluation report here. Engage Cymru is on Facebook! Make sure you like Engage Cymru's Facebook page for links to upcoming events as well as articles and other items of interest. Click here to visit! In May 2016 a full day symposium took place which explored policy and practice in arts and health and showcased a range of innovative practice from across Wales. It aimed to move the Arts Health & Wellbeing sector forward and explore opportunities for advocacy, collaboration and networking. Speakers included Tim Joss, Founder and Chief Executive of AESOP (Arts Enterprise with a Social Purpose) and Co-Founder of the Arts Impact Fund, John Wyn Owen, Chair Health Protection Committee, Welsh Government and Council Member of Health Action Partnership International (HAPI). Films of the Keynote Presentations plus PDFS of the Showcase Presentations are now online, along with reports on the Symposium in both English and Welsh - click here to view.